Here is a glimpse into what my living room looks like! Okay, i`m joking, but I`m loving the couch pattern and the colours! 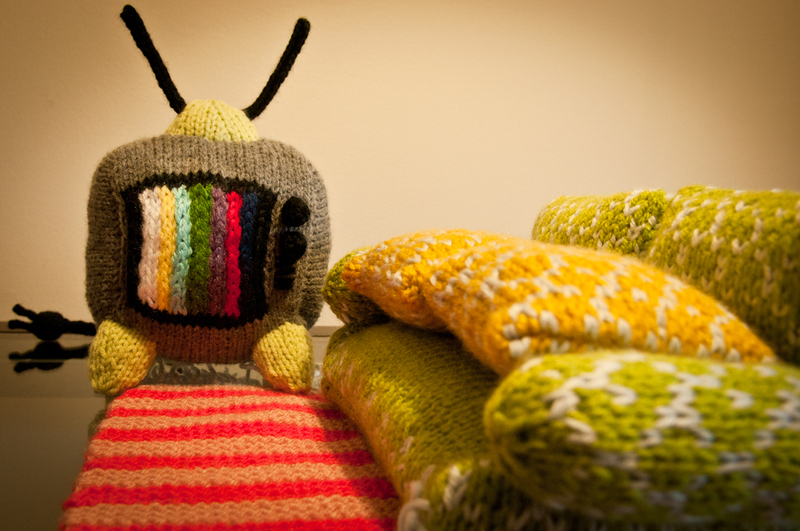 I super duper enjoyed knitting this couch, TV, and rug! 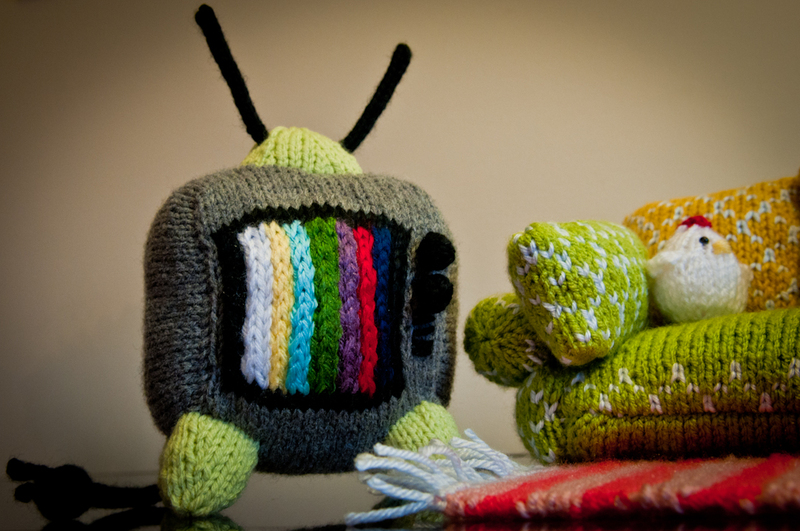 Take some time and knit something cool for yourself as well! I love the game Plants Versus Zombies!!! So if that sunflower looks familiar, it was definitely based on the game. I will try to write out the pattern for this on another post! Wow, this is so cute! What an adorable idea! Love the little bunnies and chicks. That is too fun! I love the tv with the test pattern and rabbit ears. You are so creative! Thank you! I wish I had some magic to turn the toy couch into a real couch! This is adorable. 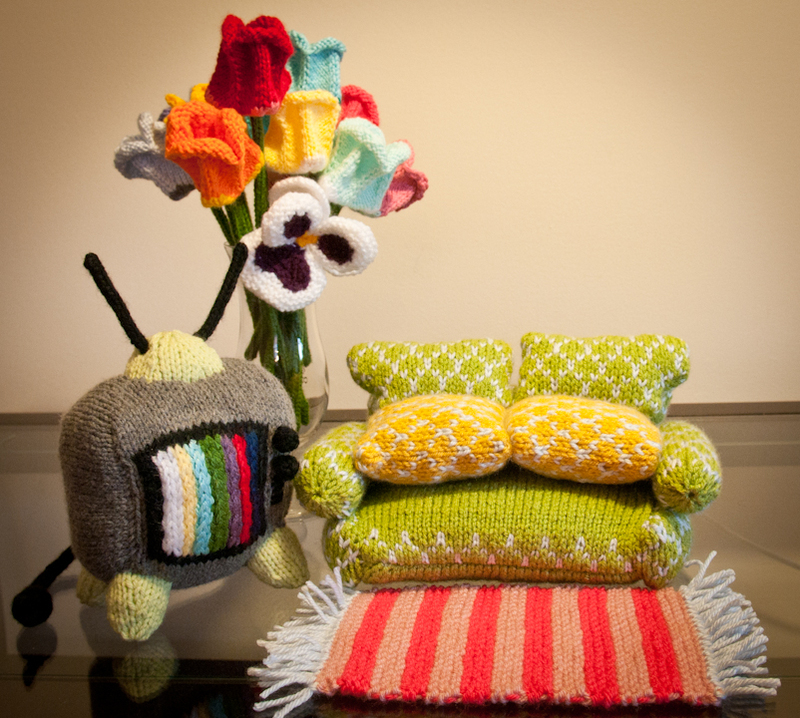 I can imagine having an entire dollhouse of knit furniture! Well, I can’t wait to see the rest and the other toys you have in mind! These are absolutely adorable! I could never quite get down knitting, which makes me so awed by this! Fabulous! I think my Descartes would like to sit on your sofa and ponder the meaning of existence, while he watches the test card on TV. HAHAHHA YES of course he can but when he discovers the real meaning of life, i’d like to know! This is adorable! Love the detail on everything. I can see my kids playing with this in their doll house. Thank you! This couch ate up all my stuffings! Do you knit as well? Most awesome! All the way down to the prongs on the tv plug! OMG!!!!! How fun is this!?! I love it!!! So glad I stopped by your blog and thanks for checking out mine! YAY!!!!!!!!!!!!!!!!! I know NOTHING about spinning fiber and your blog was VERY informative with detailed pictures! Thank you for your wonderful comment! hahaha I wish I can just take this to a furniture store and say, “make this”. I love her books. 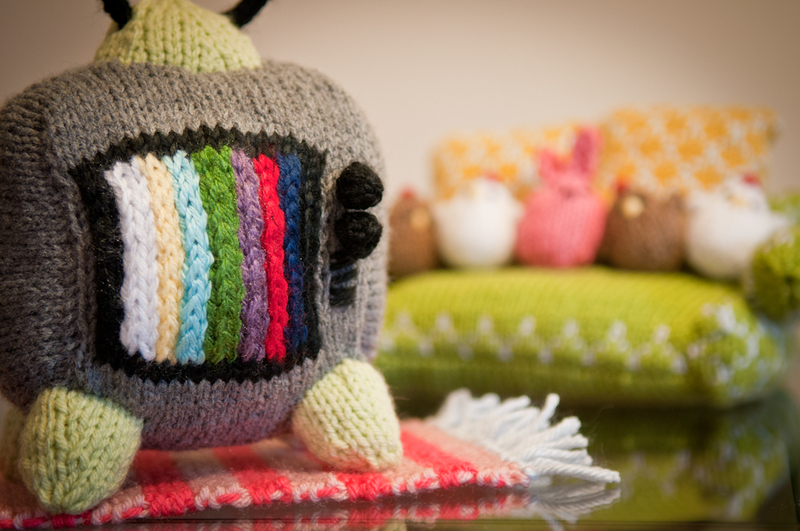 I haven’t made the couch, but I did knit the TV for my hubby. What colours did you use for your TV? I used Cotton Supreme’s Summer Camp for the TV part and then used Shepherd’s Wool in gray for the screen and I added yellow beads for the eyes. For the cord I used black Shepherd’s wool and can’t remember what I used for the feet. It was a stash busting project. I dabble in many crafts, but knitting hasn’t been one I was able to conquer, so I’m extra impressed. I like sewing, some clothes and shoes, but mainly make handbags. Sometimes sew little toys and things. Also embroidery, various paper crafts, seed bead jewelry. Tried working with glass and ceramics before; fun, but pricey and needs proper studio space. WOW! You are so crafty!!! My mom is an excellent seamstress and I wish I inherited some of her skills! When I was little, I use to watch her sew wedding dresses and evening gowns! Oh my goodness! This is so cute, I love it! Was it difficult to knit so small? Thank you for your comment! 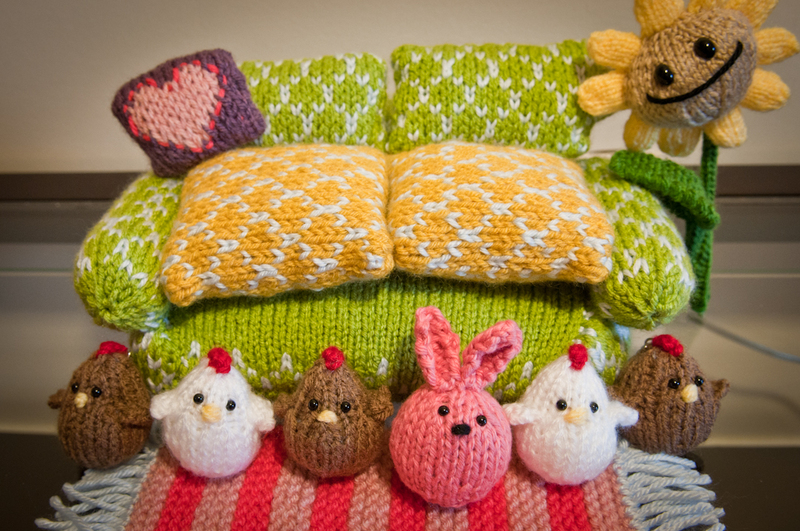 The little chickens and bunny were fun to make and at times I did feel like I was going to snap the needles in half! It’s hard to knit front and back on the same stitch in a round!